I totaled up our gas receipts (well Clint's!) last night. NO WONDER we don't have any extra money. We spent $550 on gas this past month!!!!! About $80 of that is me... the rest is all Clint.... It's only going to get worse. In trying to do something normal for a change, we decided our 4th of July party is ON. I debated on having it or not this year. It's just so much work hosting. I'm already drained from all the stress and running back and forth to MC. The food won't be too hard as we are asking everyone to bring a dish to share. (We always do "pot luck" for the 4th since we invite so many people, but of course there are always those that show up empty handed -- UGH!) I also feel a little guilty having a huge party while my mom and dad sit at home all by themselves.... We'll have a ton of yummy food, and they will have nothing... They are invited of course but I doubt my mom will be well enough to make it. My mom may have had a stroke. Or she could have Alzheimer's. Whatever it is... the doctor said it's something that hit all of a sudden. It wasn't gradual because she was FINE a few weeks ago. She is being admitted to the hospital. The doctor wanted to put her in tonight, but they are waiting to go until tomorrow. They wouldn't do anything tonight anyway. My dad is trying to find someone to sit with her, because she probably won't stay alone and he doesn't want to stay there 24/7. She is doing all sorts of weird things tonight. Moving things.. shuffling things around.... answering questions in weird tones. And Clint is in Lafayette. I'm all alone trying to wrap my head around what is becoming of my momma. Valerie keeps saying "Don't cry momma!" But how can I not? My dad had to call the police yesterday to come help with my mom. She sat down on a step stool to look for something in a bottom cabinet. She couldn't get back up. My dad called for a policeman to come help get her back on her feet. The Pain Clinic called to check on her, and when she told them how bad off she was, they told her to see her regular doctor ASAP. She is going today. I told my dad to ask for a Lyme Disease test, to at least rule it out if nothing else. I wish I could go to some of these appointments with her, but there is no way I can leave the girls with someone 2-4 times a week to go. And I can't lug them around to spend hours in doctor's offices. I felt so bad Sunday - Father's Day. I cooked dinner and brought it to my parent's house. My mom couldn't get out of bed. She only ate 3-4 bites of her dinner. She looked so helpless lying there staring at me in silence with a blank look. She is so very thin and pale and listless. I tried to put clean sheets on her bed, but she didn't seem to understand what I was doing and wouldn't/couldn't get out of her bed. Clint is staying in Lafayette tonight. He said he will be staying a little late to go over some things about his new job, so he can't drive home. I am not happy about it. For one, he has been gone for five weeks! I want him home! And second, he took a full time job there. He will be driving back and forth 14 days straight... as mentioned before, very late and very early every day after working 12 hour shifts. How is he going to do that when he can't do it for this ONE day??? She went yesterday for her first steroid injection. It was fairly uneventful... she went in, they took her to the back, and she was ready to go home after 2 hours. So far, it hasn't made any difference. It may take 2-3 more injections before she sees any improvement. Yesterday (and today) she seemed MUCH more coherent. She was normal yesterday, and I talked to her today and she sounded like her old self. Other than still being in pain that is. Maybe it is something she is taking. Sometimes medicine affects older people like that.... I can remember my grandpa halucinating after taking Demerol. Monday she goes for a CT scan. Tuesday they will retry the MRI. Friday is another injection. Something has got to work. I want my momma back. Clint is home a day early!! It took some convincing to go, but my mom had an appointment at the Headache and Pain center today. I figured it wouldn't hurt and they would take her seriously and run some tests to find out why she is hurting so much. I made arrangements for the kids so I could go with her. Her appointment was at 12 noon, so I got there about 5-10 minutes before that to find they were not there. I was about to go inside the office building, and I got a Yahoo message from my mom on my phone saying they were just leaving Morgan City!!! If I had known, I could have stayed home another 45 minutes and let Veronica nap a little longer. They finally arrived 40 mins late and I had to fill out a ton of forms. I do have to say the staff was very nice. They were very thorough with their questions about her discomfort. She was sent for an X-ray, and as I was leaving she was going for an MRI. I had been gone for 4 hours, so I had to get back to the kids. They were going to give her orders for a CT scan at the hospital. And she is supposed to go back for an anti inflammatory injection tomorrow or Friday to help with some of the pain. So, no real answers yet but at least some progress as far as diagnostics go. I don't know if she is distracted by the pain, or if it's lack of sleep, or if it's something more serious, but my mom is seriously confused. I almost wonder if she didn't have a mini stroke or if it's the early stages of dementia. My dad said she sat around this morning doing nothing. It was like she didn't have any concept of time and that's why they were so late. He even sat in the car waiting for her, and then found her sitting in front the computer!! If you know my mom, she is NEVER late. If anything, she is always early. Yesterday she had an appointment at the chiropractor that she totally forgot about. She had trouble signing the sign in sheet at the front desk. She didn't understand where the nurse was directing her to sit - on the examination table. (? where else would a patient sit?) Everything that was said to her, she'd look to me to answer for her or for me to repeat the question. I know she didn't understand half of what was said today. I mentioned to her about the injection for the pain before I left, and that was news to her. The doctor explained in detail what it was and how they'd do the procedure, and she didn't understand any of it. My dad said she is doing things like leaving the refrigerator door open. When they left today, she walked out and left the front door to the house open. My dad had to get out of the car and go back to shut and lock it. I know all of these things may seem like nothing, but I know my mother and all together it tells me that something is very wrong. My mom just messaged me they were home. She was starting to panic half way through the MRI, so they didn't complete it. My dad made another appointment for tomorrow, and my mom said she is going to CANCEL it. So... a lot of good it did to spend half the day there if she's never going back. Clint drove in Friday evening. I felt so bad for him. He was exhausted after a long day in class and a long drive home. 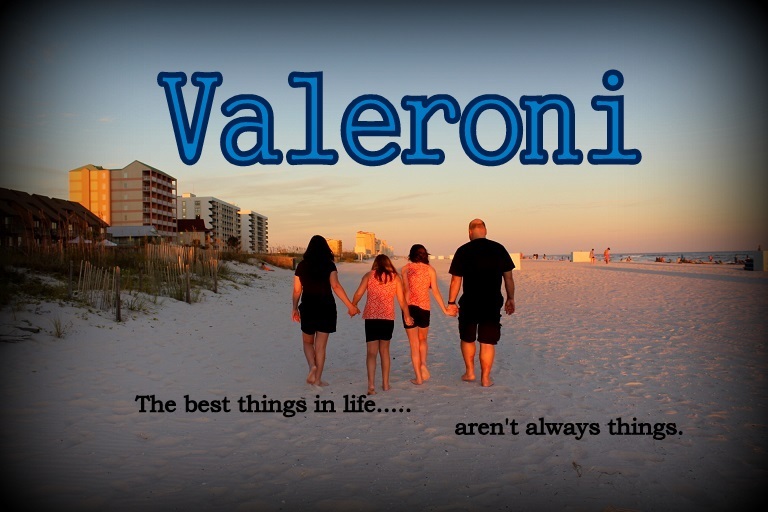 Valerie and Veronica were SO happy to see him. And I was too of course!! Saturday was a lazy morning just catching up on things around the house. In the afternoon we decided to walk the mall to get out of the house. Valerie loves going to the mall to ride the coin operated rides. I bought Veronica her first pair of real shoes while we were there. After we got home, we took the kiddos outside for some fun in the water. Both of them were so wound up they would NOT go to sleep! Valerie was up until almost midnight -- ack! Today we had a surprise invite to a family fun day/crawfish boil. One of my cousins helped organize it for the company he works for, and invited us and my parents. It happened to be right by our house, so we had no reason not to go. I used to see my cousin out and about in the bars and such, but I saw him for the first time in YEARS at his sister's wedding a couple weeks ago. It was so nice of him to extend the invitation to us. His wife is one of the nicest people I have ever met. We had a great time! Val loved the bounce house and there was a silly clown show that kept her entertained. Tons and tons of food. We probably would have stayed much longer if Clint didn't have to go back to Houston. Speaking of... Clint is gone again. He left this afternoon to drive back. He'll be coming home again this weekend for Father's Day. Only two more weeks and this whole ordeal will be over. I went to visit my parents today. My mom is still not doing well. If anything, she is worse. She does not look like herself at all, so I know she is feeling really bad. To me it almost seems she has aged 10 years in the last few months, if not weeks. Mostly it's her hip bothering her. She can barely walk. She actually got a handicapped tag for her car and a walker now. Yesterday she told me she felt so sick that she didn't think she would be here much longer. And she said please come visit tomorrow. So that's why we went today. None of the doctors she has seen have done ANYTHING. No x-rays. No MRI. So how can anyone be so certain it is arthritis? Sciatica? A pinched nerve? They are guessing. I am trying to convince her to go to the pain center here. I am certain they will DO something and not just look at her. She says she will likely end up going there. So why not just GO now? I told her I'd figure out something to do with the kids so I could go with her. When I left today she said she was going to call for an appointment because she can't live like that. I hope she follows through. I tried not to get my hopes up, but I guess I did. Clint said there was a chance he was coming home for good this weekend. They were leaning towards finishing up the on the job training in Lafayette or New Orleans. Yesterday they decided Houston. It'll be another 2 weeks before he comes home. He's already been gone 4 weeks, so I guess 2 more won't make much difference. Clint says he is coming home this weekend no matter what. I can't wait, but then again it's almost pointless. He'll drive 5 hours home Friday night. Spend Saturday with us, and then drive back Sunday morning. I am so ready for this part to be over.